1. Pays for unlimited internet. 2. Does not subscribe to any TV service that requires a specific TV set top box. 3. Takes advantage of free TV services from the internet or from over the air TV station broadcasts. 4. Uses their mobile smart phone or voice apps on tablets/computers for phone calls. Concerning point 2, I predict that eventually all TV (live and VOD) will be available on apps for smart phones, tablets, PCs, and gaming consoles much like Netflix is today. 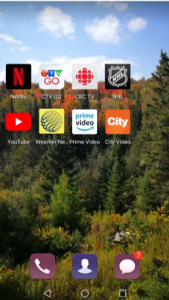 This is “TV everywhere” service with no specific device requirements. Over the air broadcast in point 3, is not hyped much except on cord cutter web sites. These sites advertise and review new retail digital antenna products to pick up digital TV channels – some even on rotors like the good old days – providing a clear HD picture. This could become a much larger trend with the adoption of the new ATSC-3.0 standard for TV stations. This supports 4K resolution, longer range, and connections to smart phones, laptops and tablets. The broadcast can also synchronize with other apps and streaming services through the residential internet feed. The standard is still being finalized, but there are stations in the US and South Korea (Winter Olympics) testing today. For phone calls, it has been a trend for 10+ years that more and more households no longer have a “home phone” but rely on cells phones, voice apps and social media apps for communications. Some perseverance is required to find and set up favorite TV channels and shows, video on demand, voice apps, and social media and today some patience is needed for slow or congested internet connections especially if multiple users on many different devices are active in the house. TelMAXfibre to the home meets all the performance now and for many years in the future. I predict that the term “cord cutter” will disappear. It is just an intermediate state from the old way of paid subscriptions on specific devices to the new “everything is an app on any device” world which will offer much more choice and flexibility for each user.